The University of Richmond has been at the forefront of colleges exploring modern approaches to student well-being. That commitment is being strengthened thanks to a lead gift commitment from the Walrath Family Foundation, a philanthropic foundation established by alumni Michael and Michelle Walrath. This gift will launch a fundraising effort to bring together wellness initiatives, resources and departments under one roof. The state-of-the-art facility will be dedicated to campus well-being that can create a life-long impact on our students and community. The Well-Being Center is designed to be a collaborative high-impact environment to support student learning and well-being. It will house all campus health care in one location, including the health center and counseling and psychological services, providing convenient yet discreet access for students. The building also will feature a welcoming public space with an abundance of natural light and health promotion amenities making it a destination for students. The new facility reflects a comprehensive approach to well-being, integrating offices such as the Student Health Center, Counseling and Psychological Services and the Center for Sexual Assault Prevention and Response, as well as wellness education and nutrition services. Locating these important student services in a single location will enhance the university’s ability to provide integrated care and support for students. The new building will include features that will encourage students to visit the facility not only when they need care, but also when they want to be proactive and be well. 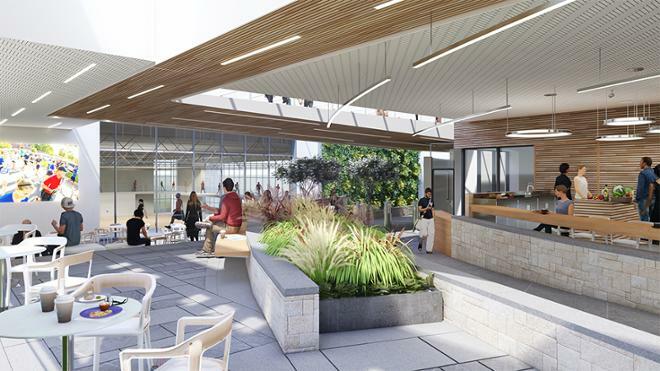 This includes a health food café and patio, mindfulness and meditation facilities and services, and a venue for speakers and interactive learning focused on wellness. The new Well-Being Center represents another step forward in the university’s commitment to well-being. Leveraging the strong foundation that was established with the creation of the Weinstein Center for Recreation more than a decade ago, putting the university at the forefront of college wellness programs, Richmond recently established a Health and Well-being Unit, which aims to more closely unite the university’s medical, counseling and health education efforts. Faculty and students are exploring such subjects as access to healthy food and the business, legal and sociopolitical aspects of health care. Others have begun to incorporate meditation and mindfulness to facilitate deeper connections with both course content and classmates. “This center will enable students to develop a holistic approach to well-being that will not only serve them while they are on campus, but all of their lives."